IS/LAND is a collaborative comprised of Taiwanese, Taiwanese-American, and Chinese-American artists. THAT WE WALK w/ BURROW, TOUSLE. Each step builds the unspoken story of the land that we call home. Islands, while autonomous and isolated by water, also bare the marks of woven narratives, reconciliation, and stories of home, longing, and humanity. Where we have walked brings forth discussions and questions about our relationship and concept of home. IS/LAND: That We Walk contends that we continue to walk, building our hope for a future narrative and a stronger sense of self; exploring how we might answer questions of separation/autonomy, identity, and belonging. 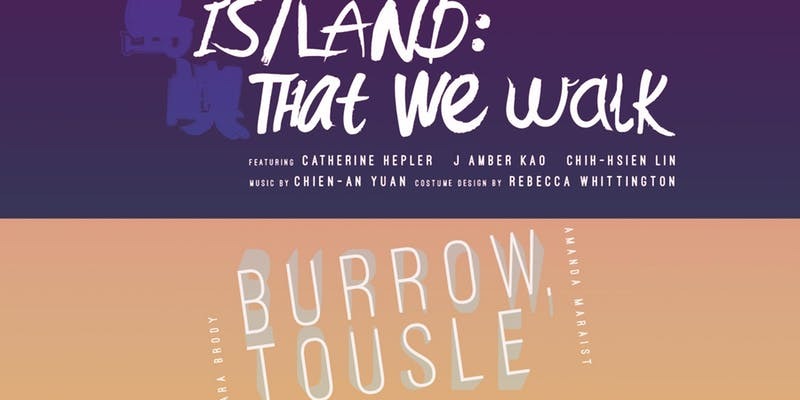 IS/LAND: That We Walk is the inaugural production of the eponymously named IS/LAND, a collaborative comprised of Taiwanese, Taiwanese-American, and Chinese-American artists. Featuring dancers Catherine Hepler, Chih-Hsien Lin, and J. Amber Kao, with music by Chien-An Yuan and costume design by Rebecca Whittington. BURROW, TOUSLE is comprised of two improvised solos existing, meeting, and colliding in the same space; unearthing what it looks and feels like to be at home.